Wow! Nakumatt has outdone itself again in the form of Nakumatt Westgate and the Westgate Centre! Granted, I am sure credit for the center is not all Nakumatt’s (as I hear Nakumatt leases the space it occupies), but still I am sure Nakumatt had a great role to play in making the Westgate Centre what it is today. I first noticed what would later become the Westgate Centre sometime early last year, on my way to Nakumatt Ukay. Not far away, I noticed some heavy construction going on, which I later found out was going to become a huge state-of-the-art shopping complex. I heard and read many things about this upcoming shopping complex, but nothing prepared me for the beauty and grandiosity that I saw the first time I visited the center for myself. Upon entering the Westgate Centre main gate, I was immediately at a loss about where to go. Luckily, there was a guard present to point me in the right direction. Yes, Westgate is grand like that. Finally, I found the parking lot which consisted of parking spaces spread out in all directions as far as the eye could see. This is one place where parking will never be a problem (or so I expect! :-)). To make you understand how unusually large the parking lot is, let me just tell you that the parking lot is color coded (with strips of color on the pillars of the parking lot) in order for customers to easily identify the general area in which their car is parked (at least that’s what I imagine the color is for). Once more, with a little assistance from the guard in the lot, I managed to find my way to the entrance of the center. As I climbed up the ramp leading to the first floor, I oohed-and-aahed at the magnitude of the center and its magnificent decor. The center is truly grand and beautiful. 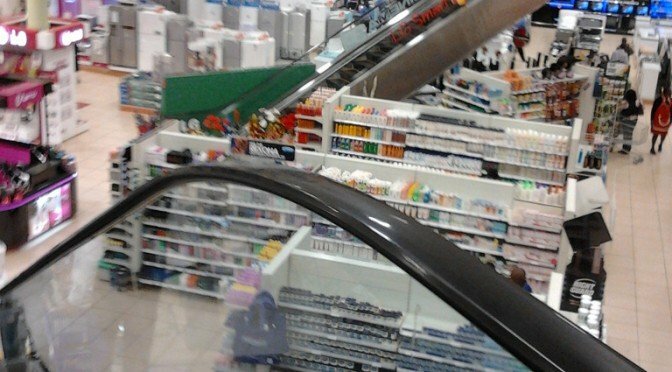 On the first floor, I easily found my way to Nakumatt, whose entrance is literally so big it’s hard to miss :-). First, I stopped at the customer service desk and was impressed with the efficiency of the service there. The customer service desk is accessible from all four sides (with enough people to handle the kind of traffic that such exposure generates) so I was served very quickly. I then wandered into the main store, which seemed to sprawl (tastefully) in all directions. Forget about aisles! This store, housed on two floors, has clearly demarcated sections and escalators to move between floors. It made me think of a typical Western department store. I hear this Nakumatt is the largest in the country (according to a Nakumatt employee) and is not a supermarket but a hypermarket. The appellation is aptly given! On that first visit to Nakumatt Westgate, I was in a great rush and didn’t want to spend a lot of time wandering the store in search of the few items I had come to buy. Instead, I decided to ask for help. When I asked an attendant to direct me to the areas of the store where I could find what I was looking for, get this: the attendant not only pointed out the areas to me, but even escorted me to each of the various areas. No wonder Nakumatt keeps getting awards for outstanding customer service! That day, I visited the luggage section, the toiletries section, the stationary section, the beverages section, and the fresh produce section. Although I rarely buy fresh produce anywhere other than at the green grocer’s at Yaya, the beauty and organization of the fresh produce section at Nakumatt Westgate tempted me into buying an item or two. (By the way, I hear that Nakumatt Westgate now has an organic produce counter in its fresh produce section. Have you seen it yet?) Every section I visited impressed me thoroughly. Way to go, Nakumatt! Want to know more about a great sexual find I made at Nakumatt a while back? Read more at Durex Lubricant Gel: Durex Play 2-in-1 Massage Gel. I didn’t get to visit the rest of Westgate Centre that day because as I said earlier, I was in a rush. Since then, I have been back a number of times and have been impressed with other stores in the complex such as Mr Price Home, a home furnishing store, and a perfume store not far from it. Have you visited Westgate Centre yet? How about the Nakumatt there? What do you think? Are you impressed or not? I’d love to hear what you have to say! Sorry for the time it’s taken me to respond to your comment. I’m not entirely sure I understand it though. What are you referring to that is a good way of finding out what’s new in the market?